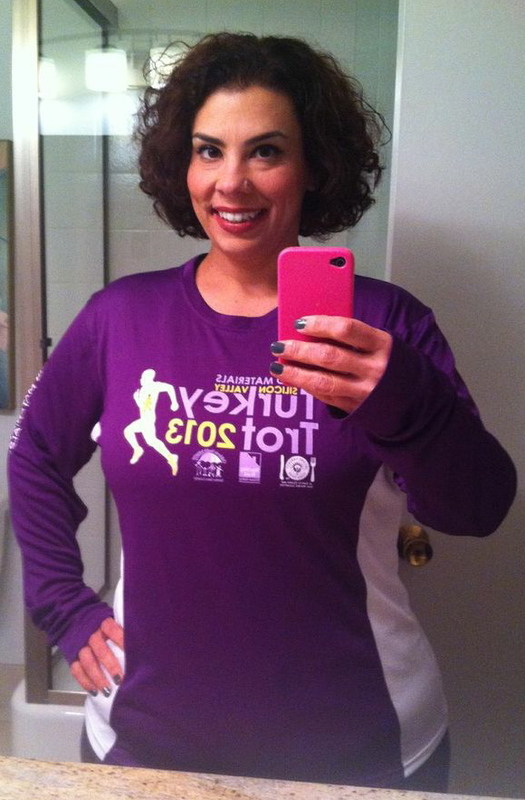 Yesterday I went to Sports Basement to pick up my bib for the Turkey Trot. Originally I was going to get a women’s XXL, since the race shirts are the technical tees that are slim fit, but they didn’t have any that size. So I knew it was time to get a men’s tee. I went over to the XLs, and one of the guys doling out the shirts told me, “there’s no way that shirt is going to fit you – it’s way too big.” Too big!!! An XL! I mean, just a couple of months ago, an XL in men’s wouldn’t have fit me at all and I would’ve been hoping I could stretch out an XXL. So, I picked up a large, and… it fits. It not only fits, it looks good! This morning I started bright and early on the hybrid and did the elliptical for 45 minutes! I haven’t done the elliptical for more than a month, favoring the recumbent bike, but this morning I wanted more of a burn. Plus, I wanted to push myself a bit more. I told myself, “just do it for 30 minutes.” Then when it was getting closer to 30 minutes, I said, “go till 45 minutes, you can do it, no problem.” And I was right. Pushing myself a bit more felt great, and I burned 646 calories! I’m going to do it again tomorrow morning, but I’m going to put in an hour. Today I got to spend lots of time with my sister and my 6-year-niece (the older niece is on a Girl Scouts camping trip in Point Reyes, so she’s having fun, too). This afternoon we went for a nice walk at the Rose Garden with the pups, and then after dinner we put on our dancin’ shoes and had a ton of fun playing Just Dance 4. My little niece is quite the hip-hop dancer, and whenever a song with an upbeat tempo came on she’d say, “now THIS is my kinda song!” Too cute. It’s great having so much more energy to do all these fun activities with my family. Happy Monday, Everyone! Another Monday that I’m playing hookie – two Mondays in a row! I’d scheduled the day off today weeks ago when I looked at my calendar. I have a supervision duty on Friday night from 6:30pm-9:30pm and then I have to turn around and be at school at 7:30am on Saturday morning to proctor the PSAT, and I realized that next weekend is going to fly by, so I might as well extend this weekend. The plans for today are to get some household chores done, make a long phone call to my uncle who lives in Michigan, read, blog, and work on some curriculum planning. I’m also planning on going on a nice long bike ride once the sun finally breaks through this morning fog that we have going on today. If you’ve taken part in FMM then you know the rules. If you’re new, please take a moment to answer this week’s question on your own blog then add your link in the comments section at: www.alltheweigh.com so we can all see your FMM questions and answers. Please invite your blog readers to add their links here too so everyone has to opportunity to be seen. 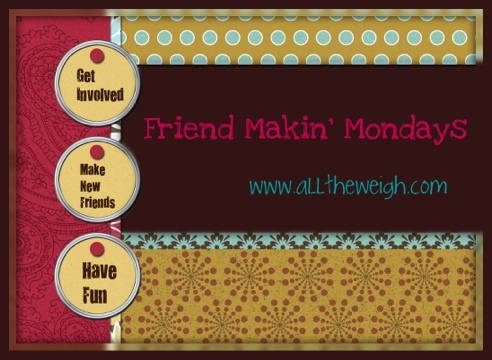 The idea is to connect with other awesome bloggers so take a moment to post your own FMM post and comment on a couple of other posts. Now it’s time for this week’s topic! 1. Choose three songs that would be on the soundtrack of your life. These Are Days by 10,000 Maniacs, In Between Days by The Cure, and There’s a Girl by The Ditty Bops. 2. Share the details of one project that you’re currently working on. For work, I’m designing curriculum units on The American Romantics: Light Romanticism, Transcendentalism, and Dark Romanticism. Then we’ll move into Realism before the end of the semester. I’ve covered these literary periods in the past, but I’m redesigning the units by focusing on stories rather than novels, covering each movement in more depth. Since I’m using entirely different literature than I have in the past, it means creating new assignments, essay prompts, quizzes, and a semester final. It’s a lot of work, but I love the challenge because it keeps things fresh, which isn’t easy to do after 13 years of teaching American Literature. At home, I just finished decorating for Halloween and Fall (although more Fall will come into play once Halloween is over). My other mini project is to make my own version of these Motivation Marbles that I found on Pinterest. I’ll definitely post about it when I’ve made them. 3. If you could learn to do one thing overnight what would it be? I’m taking my cue from Kenlie and I’ll say that I’d love to know how to speak Italian fluently. 4. If you could be a fictional character which one would you be? Wow, this is a hard one for me because I have so many characters swirling in my English teacher’s brain. Most of the literary characters I know lead lives that end sadly, so I’ll choose Samantha Baker, who is Molly Ringwald’s character in Sixteen Candles. Who doesn’t want to kiss Jake Ryan?! 5. What’s your favorite thing about the month of October? I love the layered clothing, the crisp mornings and chilly evenings, and the fact that The Holidays are more than a month away. Don’t get me wrong, I love The Holidays, but life gets really hectic during that season, so it’s nice to enjoy the calm that comes with October. 6. Share one TV show that you’re embarrassed to admit you watch. I’m not really embarrassed by this, but I do watch every Real Housewives franchise. 7. Name one friend that you’re thankful to have in your life today. I am immensely thankful that I have ScaleWarfare in my life. She is one of my best friends, a huge support, and an amazing person. She’s making some major life changes, and I am so proud of her for making sure her life is as healthy as possible in every aspect. 8. What was the most relaxing part of your weekend? I was able to spend quite a bit of time reading, which is always really relaxing for me. I just finished reading Jane Vows Vengeance by Michael Thomas Ford and I’m currently reading The Opportunist by Tarryn Fisher. 9. Do you like to dance? I love dancing! In fact, yesterday my 5-year-old niece and I held a mini dance party as we played Wii Just Dance for about 30 minutes. 10. Share one thing that you’re looking forward to before the end of the year. I’m looking forward to meeting my mini weight loss goal before the end of 2012. It has been my main focus of the year, and it will be such an accomplishment when I meet the goal. Now it’s your turn to share. Don’t forget to go back to Kenlie’s blog to link up in the comments! I’ve had four fantastic days off and I feel so rejuvenated! It’s weekends like I just had that make life good. And I really needed a wonderful weekend, because there’s been quite a bit of stress in my life lately (some big, some small, but all annoying), and it was nice to just leave that all behind and enjoy myself. On Friday I really didn’t do a whole lot of anything. I was online for a while, I read for a while, I watched some t.v.. Later in the afternoon when my parents brought my nieces home we all went on a long walk and enjoyed the sunny, cool day. The girls stayed at my house catching up on their favorite Nickelodeon shows until my sister arrived around 5:30. They ended up staying for dinner – my sister heated up leftovers for her and the kids and I had one of my Lean Cuisine meals. It was nice to be able to share an impromptu meal together without having to put in too much effort on either part. I’m sure we’ll do that more often. As Friday nights go, this one was pretty tame, but that’s ok. I just needed to take the day and relax. Plus, I’m not 20 anymore, so it’s ok not to have major plans on a Friday night. Eventually I would love to have some dates to go on or other social engagements, but while I’m in “forced hibernation mode” I’m perfectly content to keep things quiet. I had a busy morning planned on Saturday. We began with a “whole crew” (my sis, nieces, Lulu & Minnie) walk at 9am. My older niece led the way on her bike, the younger one was on her big wheel, and my sister and I pulled up the rear with our dogs in tow. It was sort of chaotic (at least for me) and we had a few near misses with dogs’ leashes and big wheels, but it all turned out fine. I’m sure that once we get the hang of the bigger group it will go more smoothly. I do think that Lulu and I need to start taking our normal solo walks again, too, because I like our head clearing/bonding time. 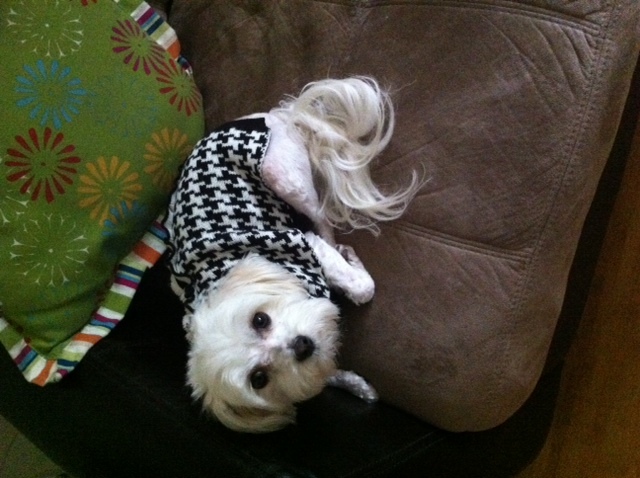 Then it was time for me to take both dogs to the groomers, and boy did they need it, especially Minnie. They came out later that evening looking like (almost) new dogs, and I swear that Minnie is strutting around with a new sense of purpose now that she looks cute again. 🙂 While I was out doing some errands, I brought a big garbage bag full of old clothes, and 2 boxes of books to a local charity, thanks to the Daily Challenge. I’d had the stuff waiting in my garage for a couple of weeks, but the Daily Challenge made me put the stuff into the car and donate it to one of my favorite charitable organizations, and it really didn’t take any effort at all. I can’t tell you how good it felt to get that stuff out of my house and on to someone else who it can be of more use to. If you haven’t gone through your closet or bookshelves recently, I highly recommend I CHALLENGE you to do it; you’ll get rid of some clutter and do a good deed all rolled into one. The main thing I was excited about on Saturday was that my high school alumnae food & wine group was going to be going to a Passport Saturday. Passport days are amazing! You buy a passport for $40 and it entitles you to one free tasting at any of the participating wineries within the Santa Cruz Mountain Winemakers Association, and there are 51 wineries that participate! The passport never expires, and they have passport days every quarter – in January, April, July, and November. Originally there was a good group of alums who were planning on going to the event, but it ended up that just my friend Ms. AD and I went. And really, it worked out perfectly. This way she and I could really catch up with each other without having to worry that we were excluding others from our conversation (because there’s nothing I hate more than people who leave others out of the conversation with a lot of inside jokes, talking about people others don’t know, etc.). Ms. AD and I headed off in my convertible (the weather was unseasonably and gloriously warm at 70 degrees) and hit three very local wineries. The original plan was to go into the mountains a bit more, but I didn’t want to challenge the windy roads of those mountain wineries. Our first stop was a winery that I used to be a member of, Flemming Jenkins. Yes, as in Peggy Flemming. What started out as a landscaping project at one of their mountain estates turned into a really profitable wine business. 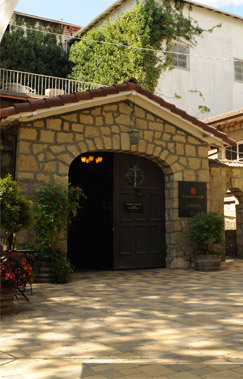 Their wines are very good, albeit quite pricey, but it was nice to begin at a winery that I knew I liked. 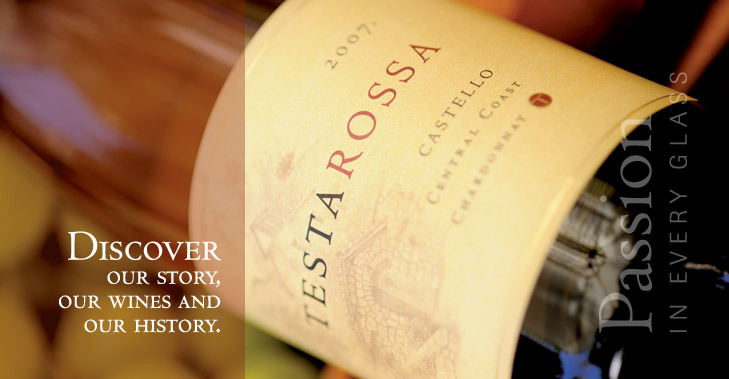 From there we headed about a mile down the road (actually, up a hill) and came to Testarossa Winery, which is one that I’d never been to but had heard amazing things about. Testarossa was a 19th century novitiate (training center for Catholic priests) before it was a winery, and the grounds are truly beautiful. 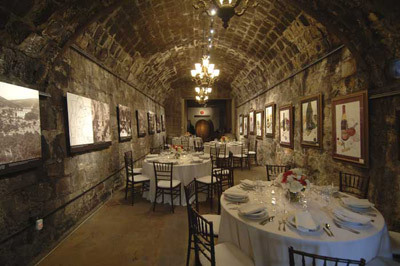 This last photo is from their website, but I’m using it because it shows the dramatic tasting room with it’s gorgeous, old-world ceiling and walls. When you’re in the room you feel as if you’ve stepped back in time and are in an underground crypt somewhere in Europe, rather than just a mile off the main road of a bustling town. It was so nice that I know I’ll have a party here at some point in the future – maybe even my rehearsal dinner (a girl can dream). Oh, and the wine, the wine was delicious and very affordable. I’m going to make sure I always have some of this on hand to share with good friends. 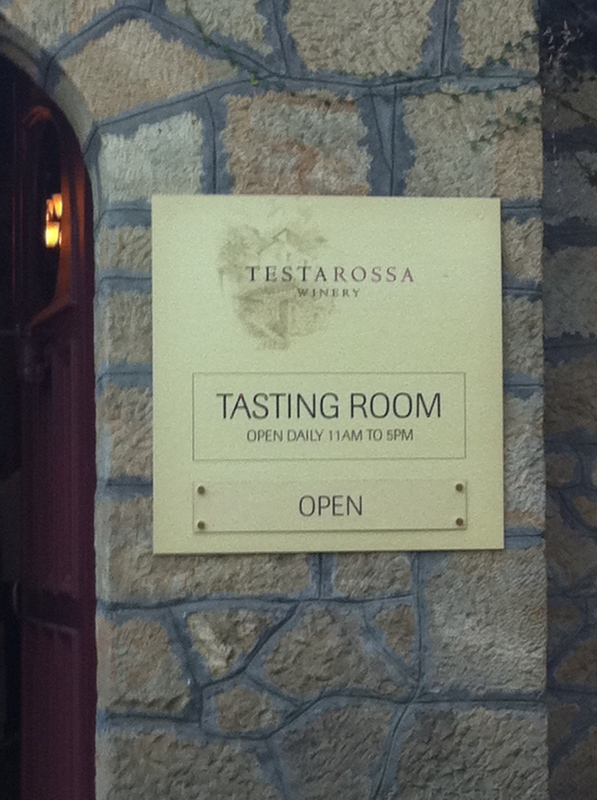 Our last stop was a winery that I had heard such good things about, but which was the least favorite of the afternoon. Maybe it was because I had enjoyed our time at Testarossa so much that in comparison Cinnabar couldn’t quite make the grade. Or perhaps it was because no one told us anything about the wine they were pouring. It was fairly busy in the tasting room, but it seemed as if the people working that day couldn’t be bothered to explain anything to potential customers. Which is a shame. And with that, I think I’ve already spent too many words talking about this place. 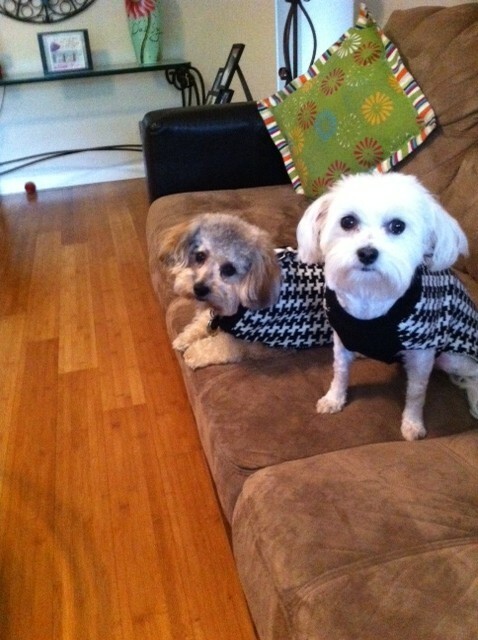 (My mom bought them matching sweaters for Christmas, and I couldn’t resist having them match in the last photo). The day began as all Sundays do – with the Sunday paper and a nice, hot pot of coffee. But I was also expecting a visit from Comcast. Luckily the tech arrived at 8:30am (the window was from 8-2). I’ve been having nothing but problems with my OnDemand service every since I moved, and I finally wanted to get to the bottom of it. I’ve had 2 other technicians out here, and placed countless phone calls (I think I average 1 every other week), but it wasn’t until today that the cableguy (who was here an hour and a half) realized the problem was that they gave me an old, obsolete receiver box when I moved in. Not only that, but I’ve been paying for a more expensive receiver this whole time. I’m relieved that I finally have the proper equipment, but you’d better believe I’m going to be on the phone on Monday demanding my money back plus compensation for my trouble. It goes to show that it attention to detail and not stopping until the job is done really does pay off. Let’s just hope that Comcast cares about their customer enough to do the right thing. The rest of Sunday was fairly lazy. Some reading, some time online, some t.v. time, a walk with Lulu, some light housework and laundry. Nothing especially exciting, but nice just the same. Sunday evening my friend Ms. AD (whom I spent the day before with wine tasting), was having a Just Dance 2 party, and I couldn’t wait. What a great idea for a party, right? It’s like those old-fashioned dance parties in the 50s. Only this time we all brought our Wii remotes and tried to match moves with the computerized choreographer. 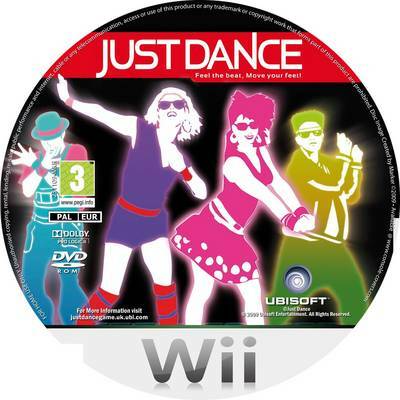 I have Just Dance, so I was used to it, although I will say I like the graphics a lot better on Just Dance 2. Plus, it so much more fun to “play” with other people, instead of just dancing around my living room by myself. I did so much better than I thought I would, and I was consistently the top or 2nd highest scoring player. And it sure didn’t hurt that Ms. AD made some killer sangria and we each brought some “tapas” with us. It was a fun time, made even more so because Ms. AD made sure we came in our comfy clothes and knew that we could be as silly as we wanted to because there were “no boys allowed.” Although after about 5 dances/songs, lots of the girls sort of pooped out and we moved from dancing to chatting, which was good too. I’m definitely going to take Ms. AD’s lead and have one of my own Just Dance 2 parties. (Speaking of which, this house has such a great layout for entertaining that I want to make sure to have some parties. I’m going to have Lulu’s 1st bday party in early February, and I also want to have an Oscar party, but beyond February, what are some ideas for themed get-togethers that I can have? I’d love any and all ideas). Today is going to be all about enjoying this day off. The weather started out really foggy again, but once it clears (around noon yesterday), I’m going to take Lulu out on another walk. This time the goal is go explore a new street in our neighborhood and walk for at least an hour. Other than that, I’m going to be doing laundry, organizing my food for the week, and watching t.v. and doing some workout DVDs. I feel like staying close to home today, but I am going to go to a group exercise class at the gym – either Zumba (@ 5:50pm) or aqua aerobics (@6:45pm); I’ll decide which one depending on what the rest of the day shapes up to be. It’s been an absolutely amazing weekend, free of stress and filled with fun and friends. I need to try to have at least 1 weekend a month exactly like this one, because it’s good for the soul. HYC Update: I’m Rockin’ It! I am so thrilled with everything that’s been going on in my life lately. I feel like all the puzzle pieces are finally falling into place and it’s all downhill (in a good way) from here. 1200-calorie Meal Plan: I’ve been doing really, really well with keeping my calories low, considering everything else that’s going on right now. I haven’t actually stayed exactly to 1200, but I’ve been pretty darn close. Most days my calories are in the 1300 range, which isn’t far off, and my highest day was 1600, which is right around what WW would say that I should eat, at a minimum. As I mentioned on Twitter, in peeking at the scale, I saw a good loss so far, and I’m hoping it’s still there on Wednesday for my official weigh-in. LoseIt! has been a lifesaver for keeping track of everything, so if you’re looking for an easy program and you have an iPhone, you should download this (bonus: it’s free!). Quitting Smoking: I’m proud to report that as of this morning, I’m smoke free for 7 days now! Or, I will be once today is through. There have been times that I wished I could light up, but I made it through them with a few deep breaths or some sips of water (a good way of getting the water in). Nighttime after dinner is still my most difficult, but I know that it will get easier and easier as the days pass. This is the longest I’ve ever gone without smoking, so I’m in totally uncharted territory here, and I’m so happy! Exercise: Honestly, this has been sort of hit and miss this past week. I’ve gone walking, swimming, and played the Wii Fit. I’ve definitely done more in the last week than I have been, but I didn’t do something each day, as I was hoping to. I’m not going to be too upset about this, though, because so much was going on for me this past week. Once my life settles down a bit and becomes more routine once I start working again, I know that I’ll fall into the habit of working out after work on the weekdays. Water: I’m still not getting in all 64 oz a day, but I’m working toward it. I always get at least 48 oz, so getting in the rest shouldn’t be that big a deal. I just have to make it more of a priority. I’m really feeling like I’m in a groove! My mindset is completely positive, and I do feel like nothing can stop me now. I can’t wait to see my progress. Just Dance, I Say, DANCE! Whew! My heart is still beating fast after my 30-min session with Just Dance. It was so much fun, although according to the game, I really don’t have much rhythm, which is so not true. The way the game works is that you follow the “choreographer” that’s on the screen. The tricky part (besides the actual dance moves themselves) is that it’s a mirror image, so while I was trying to keep up and do the same arm and leg movements they were, I would get lost because I was moving the wrong arm. I did “OK” on most moves, but the game did indicate that I “missed” quite a few as well. On the plus side, I got some “greats” in there, too. Most of the choreographed moves aren’t ones that I would have chosen for the particular songs that played, but then again, I’m no dance pro. I really liked that it was challenging in terms of the moves, because that way it keeps it interesting. I’m certainly glad I had the forethought to close the front door (I keep it open with screen locked so that I get a nice cross breeze throughout the house), so that no one outside could see me. Because judging from the look on Lulu’s face, I looked like a complete fool while I was dancing. LOL. At one point she was trying to play with me by nipping at my feet, so it was “crate time” for her. The whole time I was playing the game, she gave me the most quizzical look. I was actually laughing at her as much as I was dancing, I think. Poor little Lulu. I don’t know exactly how many calories I burned because I’m having some technical issues with the BodyBugg (see the previous post), but I can tell you that I was out of breath and sweating the entire time. I loved every minute of it. Of the 30+ songs that are on the game, many of them are old favorites, like Cyndi Lauper’s Girls Just Wanna Have Fun. Others are pop hits like a cover of Womanizer. And some are new, fun songs like Surfin’ Bird by the Trashmen which had a fun, 50’s retro vibe to it. You can click here to see the full song list. I like that lots of the songs found on the game aren’t ones that I would normally play for myself, but they all have that upbeat vibe that I love. 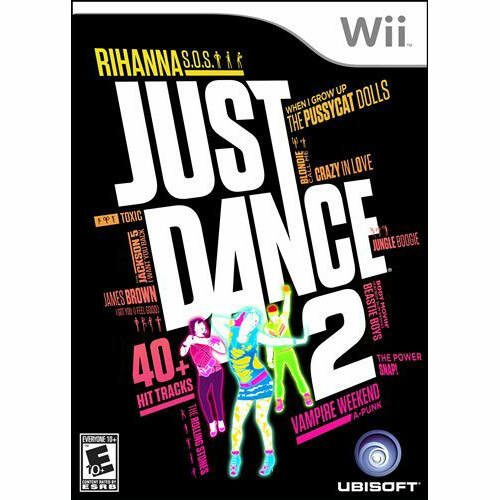 For $28 on Amazon, I would definitely recommend this to anyone who has the Wii and likes to Dance. It’s a great way to get your heart pumping, fit in some extra steps, and make your workout fun. Plus, you just might learn some new dance moves along the way. Today (it’s almost 1am, so technically this is yesterday) I went to look at the duplex that was available and I was so disappointed in what I saw. Yes, the layout was exactly the same as the one I had lived in years ago, but it was absolutely disgusting inside. Apparently the previous tenants had been evicted, and it showed. The carpet and floors were filthy, and the property manager said they “might need to be replaced.” Uh, if you want to rent it to me, they NEED to be replaced. Oh, and while you’re at it, why not update those ugly cabinets that look as if they haven’t been painted in years? The entire place just looked so run down and awful, and the yard was completely overgrown with weeds. So not worth the monthly rental fee. The property manager was so unprofessional, and not only did she show up 10 minutes late for our appointment, but she just seemed like a total airhead. When I looked the company up on Yelp, they had some really poor reviews from current tenants. Not a good sign. Which means that all 10 of the duplexes that are on that street are off the table, because the same man owns all of them, and the same property managers run them. If she couldn’t even show up on time to show me the place, I can only imagine how unresponsive they are when things need to be repaired. So it’s back to the drawing board. I’m not giving up, but I may not move out as soon as I thought (or had hoped). My quick searches on Craigslist hasn’t shown anything I’m interested in so far. I definitely want to get a duplex or a little house. Once you “graduate” from apartment living, you definitely don’t want to go back. I have decided to sign a month-to-month lease at my current location so that I have the freedom to leave whenever I want to. This buys me the time to find some place that I feel comfortable with. Because as crazy as the neighbors on both sides of me are (and for as poor as the neighborhood is), my place itself is nice and I only want to move up. I definitely don’t want to settle. I’m happy to report that Lulu is completely potty trained already! It’s only been a month, so I think that shows exactly how smart she is. She’s still a great puppy who adds so much to my life, but she has started moving into that “adolescent” stage of puppyhood. She’s started barking quite a bit, and while I know that’s normal, I don’t like it when she barks at ME. Most of the time she barks becasue she wants to play, which is fine, but the last two days she’s started barking whenever I’m not paying her enough attention – when I’m eating a meal (new weight loss tool?? ;), when I’m cleaning up, or when I’m watching t.v or on the computer. I’m trying different techniques to curb her barking at me, including giving her timeouts in her crate. I’m going to inquire at the puppy training to see if they have any other suggestions. Speaking of the training, she’s doing really well with “sit” and “lay down.” I’m looking forward to going this evening (Wednesday evening) and seeing what new tricks we learn. The main thing I’m looking forward to learning with her is recall/name recognition and loose leash walking. 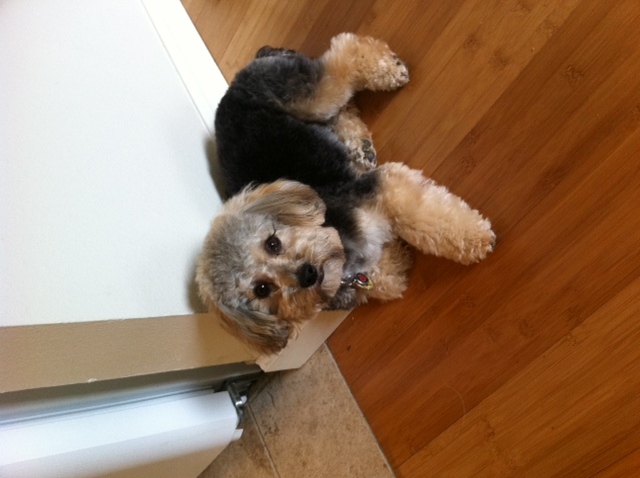 Which leads me to the fact that I think I need to start taking Lulu on longer walks to tire her out a bit more. Right now we go around the block 5-6 times a day and usually 1 good (1/2 mile) walk, but I think now that she’s gotten older and seems to be able to control her bladder better, I can cut down the walks to 2-3 longer ones a day. My neighborhood isn’t the best to walk in, so I think I’m going to start driving her to the better streets that are a 5-minute car ride away. I know that seems silly, but I’d much rather do that than walk on the streets around here where who knows what she’ll find. There’s a ton of garbage on the sidewalks near my house (I saw a Hennessey bottle strewn on the sidewalk just this morning), so I’m forced to be ridiculously vigilant in making sure she’s not getting into things. Since the nicely maintained streets aren’t very far away, it makes sense to just drive her to them. Of course I’ll still take her outside for the quick potty breaks a few times a day, but I think doing these new routes will be good for both of us. (It might also help with barking). I just bought Just Dance for the Wii, and I can’t wait to try it this morning (look for a review once I have). I’ve heard great things about it from you guys and from the reviews on Amazon, so I think it will be a fun thing to add to my exercise routine. I pre-ordered the Just Dance 2, as well, and I have a feeling I’ll like that one, too. 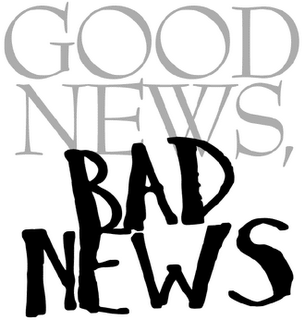 It has all new songs to groove to, so it will help keep things interesting. Despite the reported reception/antenna problems with the iPhone 4, I’m going to order one today. I have a iPhone 3G, which is 2 models behind, and I’m ready to upgrade. I can’t wait for the double viewer camera, because it will make taking self-portraits so much easier. I can’t tell you the number of times my sister (or friends) and I have wanted to snap a picture of ourselves, only to take a photo of our chins, or our foreheads, etc. The other really cool feature is the video chatting Facetime that you can do with other iPhone 4 users. There are lots of other cool things about the new iPhone. Plus, I told my sister that I’d give her my old phone, and since she’s been going through some difficult and stressful personal (relationship) issues, I want to do whatever I can to make her life better. She never gets anything for herself because money is tight and whatever extra she has goes to my nieces, so I’m more than happy to give her the old iPhone so that she can have a nicer phone.